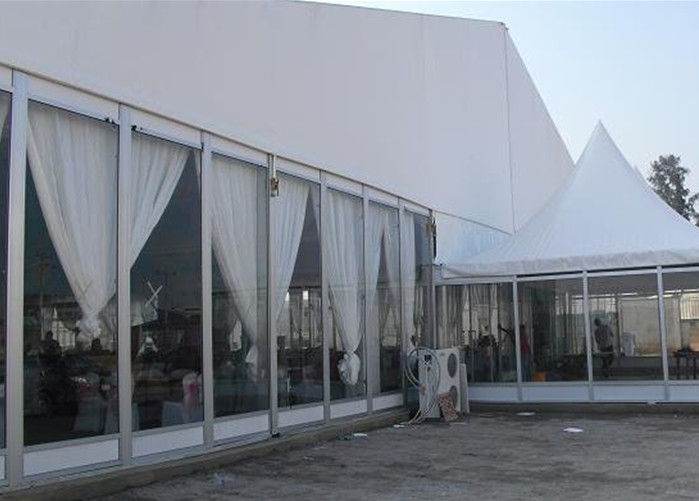 This large 25x60m tent is made of 112x203x4.5mm aluminum frame structure, 850g/sqm white pvc roof and tempered glass walls with glass doors. It’s for event center use which is for 1000-1500 people use. The side height is 4m. Wind resistance capacity is 100km/h. It’s with expand screw for fixing on concrete ground. The main frame is hard pressed extruded aluminum profile which can be used over 15 years. This frame can be extended or shortened according to the events. The roof cover is with white high quality double PVC-coated polyester textile, 100% waterproof, flame retardant to DIN4102 B1, M2, CFM, UV resistant, tear resistant, self-cleaning ability, etc. The side cover can be replaced by transparent pvc side walls, white pvc side walls, sandwich walls or solid abs walls. 4. The length can be shortened or extended according to your events. 6. Can be permanently fixed in one place.